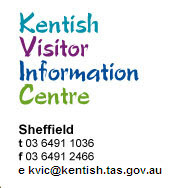 Call into Kentish Visitor Information Centre at Sheffield, part of Tasmania's Outdoor Art Gallery, on your way to Cradle Mountain. We specialise in booking accommodation, tours, attractions and providing tourism information. Visit spectacular Mount Roland, boutique wineries, do a mural audio tour and check out nearby Railton's topiary or the Wilmot letterbox trail.